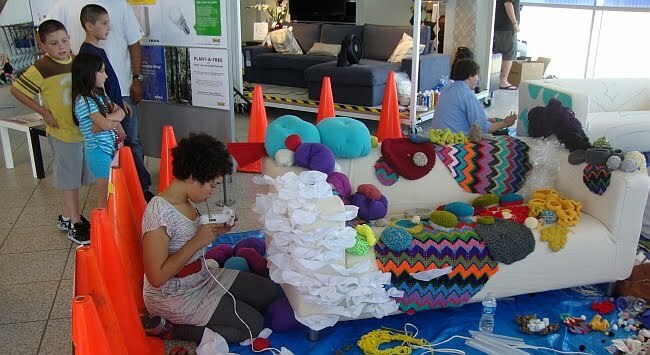 Shortly before this year's art car parade, I heard that Ikea was participating by doing a bunch of "art couches." 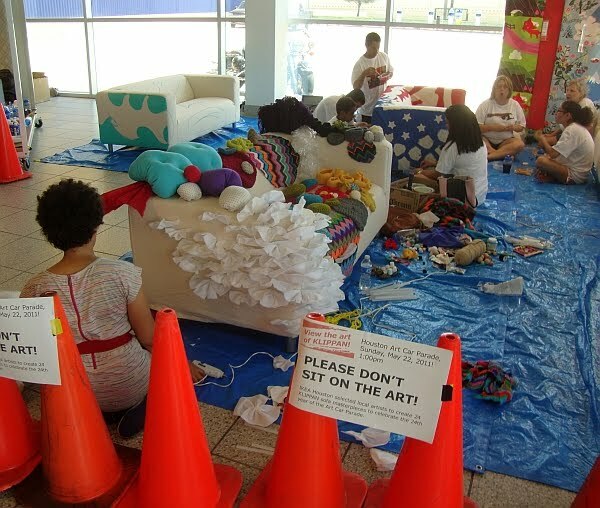 They solicited proposals from Houston artists and the ones picked would decorate blank Klippan couches in public at the Ikea store on the Katy Freeway. I figured this might make a good Pan post, so I went to check it out. 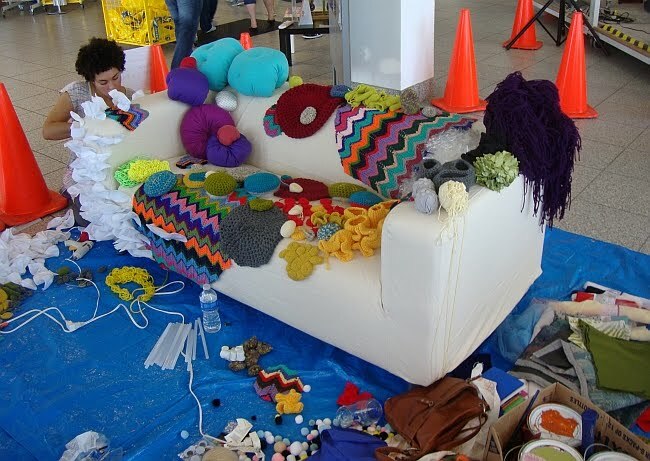 I was very pleasantly surprised to learn that Stephanie Toppin was doing one of the couches. Hers was amazingly elaborate. She had crocheted a bunch of pieces that imitated the forms of various fungi, and was gluing them all over the couch. I love Stephanie Toppin's work (and fair disclosure--I own a Toppin painting, a collage, and several of her drawings). So I knew I had a good post here, something that would go with the rest of my art car parade coverage. 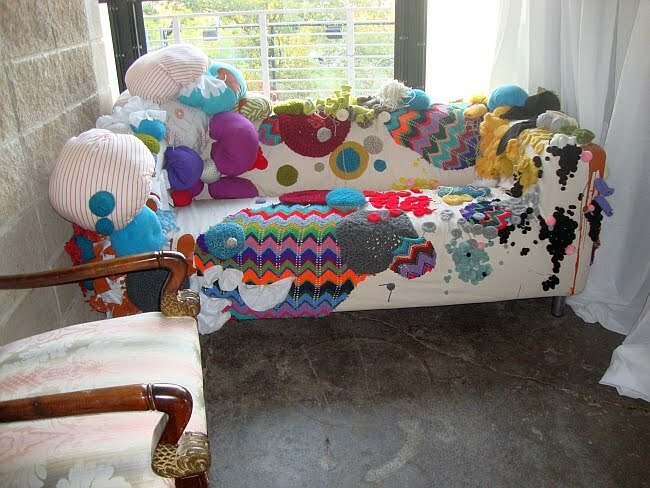 The finished couch looked great. There was something really delightful in the contrast between fungus (icky) and crocheted objects (very welcoming). 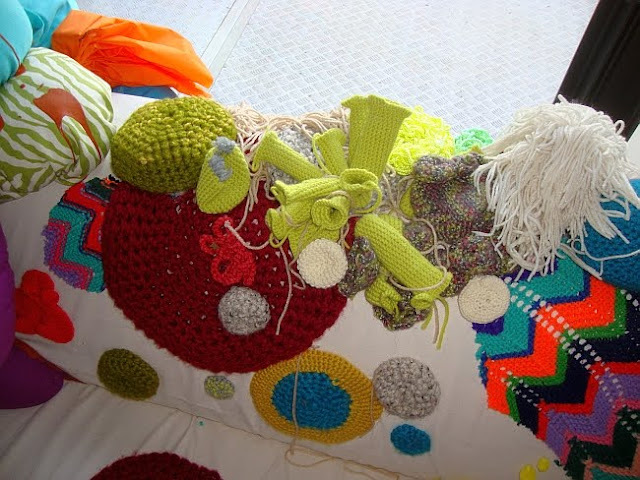 The neutral ecru color of the couch was a good ground for the colorful crochet additions. 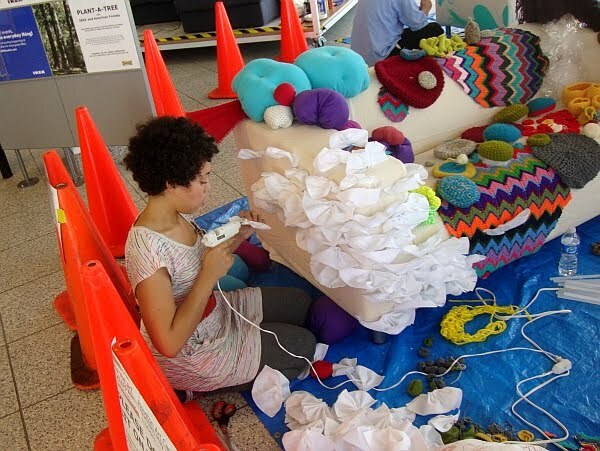 I was eager to write about the couch, so I talked to Stephanie after the Art Car Parade and asked what happened to it. She told me it had disappeared! Specifically that Ikea, which had physical possession of it, had told her that they didn't know what happened to it. I felt like the story was incomplete without knowing what happened to it, so I reluctantly set it aside. Fast forward to October. As the Blaffer Art Museum at U.H. 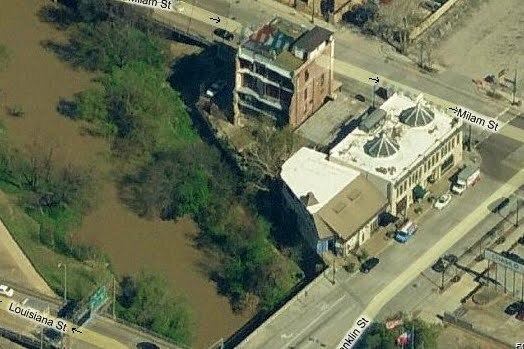 is being renovated, Blaffer has been curating some "window shows" downtown. Basically, a property owner has devoted his street-facing windows for a series of site-specific art pieces by Houston artists, curated and sponsored by the Blaffer Gallery.The building, on Milam, is actually an amazing private residence owned by Jim Petersen, Jr.
Yep, Jim Petersen, Jr. had Toppin's couch. I introduced myself to him and asked him the story. He said he had seen it at the Art Car Ball (you can see a photo of Petersen partying there in the slideshow below this Paper City article). He went back to Ikea after the parade and bought it on the spot. I asked him why he bought it and he said what all collectors should say--he liked it. He thought it was the best of all the couches (an opinion I definitely agree with). But he never knew who had created it. So one mystery now solved. What would be the ideal way to wrap up this mystery? If the Blaffer chose Toppin to do the window installations at Jim Petersen's house. She could fill them with wool fungi--and Petersen could wheel out the couch for the opening. It would be perfect. 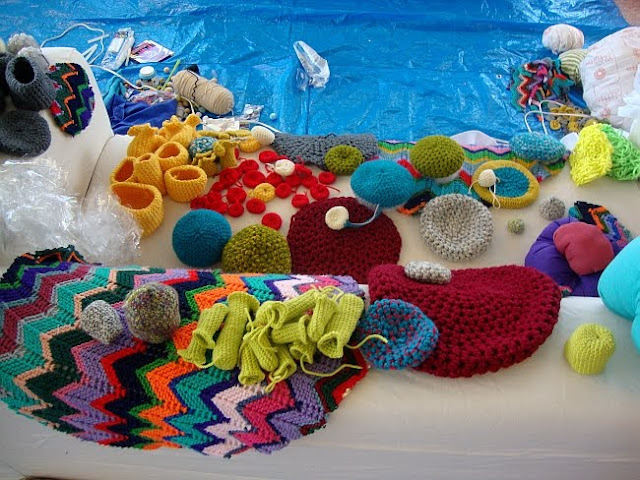 Correction: I had previously said Toppin's fungi were knit--I have been corrected. 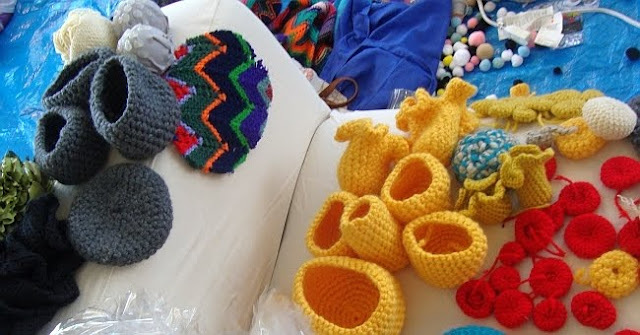 They were crocheted.